I'm no stranger to the open road. Driving to the nine hours to visit my sister in Reno doesn't even phase me. I would love to look out the window and watch the American splendor pass by, but, unless I'm at the wheel, I fall asleep rather quickly (solution: Dr. Pepper). My family has great memories road tripping together. I remember (or at least I think I remember) driving to Missouri to visit my maternal grandparents at Christmas when I was three. Momma Linda, dad, Damian, Gail, Katie, Nick, and I. One brown GMC diesel single cab truck. We had a camper shell on the truck so we stuck a mattress back there to travel in comfort and style. It was wintertime and very cold. To stay warm, we burrowed into piles of blankets and I think we had some sort of duct going from a heat vent through the small, sliding window into the bed. That's definitely the longest drive I've done. We did that same drive again when I was twelve. This past weekend, we went on another road trip through the wondrous grandeur of Southeast Utah. SUU had fall break and I thought it might be good time to visit some Utah National Parks during the long weekend and help me do my #23b423 list. So we did. I was really excited to go camping. It has been years (seriously sad) since I've been camping in the great outdoors. I was excited to sleep in a tent, and make our food, and have sand in every orifice of my body. My parents had other plans. Yeah. We stayed in a hotel. In Green River (ghetto town) which is about an hour away from Arches National Park- the first park we were going to visit. We left after SUU's loss to Weber State to our hotel in Green River. Left GR super early to hike Delicate Arch before sunrise to watch the sun rise over the park. We drove all the paved roads in the park seeing awesome formations. Driving through the park reminded me a lot of the scenery in Disney/Pixar's Cars. Momma Linda and I did a couple short hikes. Went to Dead Horse Point State Park. Left and came back because we missed the actual point. We're awesome like that sometimes. Went to Canyonlands National Park Island in the Sky District. Incredible! A well kept secret. Looks 3x the size as the Grand Canyon and has spectacular formations. Mom and I did one short hike. Ate at one of two restaurants in GR. Not impressed. Went to bed early. It's amazing how much you can get done when you wake up at 04:45. Alarm went off. Mom said "Ten more minutes." Usually I'm the one who says that. Ha. Ate breakfast at the other restaurant in GR. I liked it better, though it is more difficult to screw up breakfast. Drove to Goblin Valley State Park. The drive provided beautiful views of the San Rafael Reef. Two words: majestically rugged. Goblin Valley provided crazy cool formations. Reminded me of Big Thunder Mountain Railroad in Disneyland. It was very windy and I did end up getting sand in every orifice of my body. Capitol Reef National Park. We only saw a tiny, tiny portion of the park which is so huge! Hiked to a natural bridge. Fruita historic town would be cool to visit during harvest season. Drove. Saw fantastic views from UT Highway 12. I didn't take any photos. So sorry. Everyone should make this drive. It's so pretty it hurts. Drove more. Cute, small towns, pastures, forests, creeks, canyons. Grand Staircase-Escalante National Monument was creepy to drive through. The highway drops off on either side at one point (and it wasn't even on Hell's Backbone Road!). Drove to Bryce Canyon National Park. Ate lunch/dinner at Ruby's Inn. Four national parks. Two state parks. One national monument. Less than 48 hours. 855 miles. It was amazing how much beauty is so close to our home! Delicate Arch before the sun rises. The sun lights up the natural beauty of the park. Dad, Momma Linda, and me on a rock that overlooks the arch. Huge (and adorable) field mouse cowering in a corner of a waste bin. Me and Momma Linda. Turret Arch. Arches NP. Can you see the Parade of Elephants? Double Arch is behind the leading elephant's bum. Natural bonsai? It's only about 12" tall. Canyonlands NP. Momma Linda overlooking Upheaval Dome- a very unique geological feature (salt hills, remnants of a dome in a crater). Canyonlands NP. Dad and Momma Linda at Canyonlands NP. Driving parallel to the San Rafael Reef. Wild Horse Butte in background. 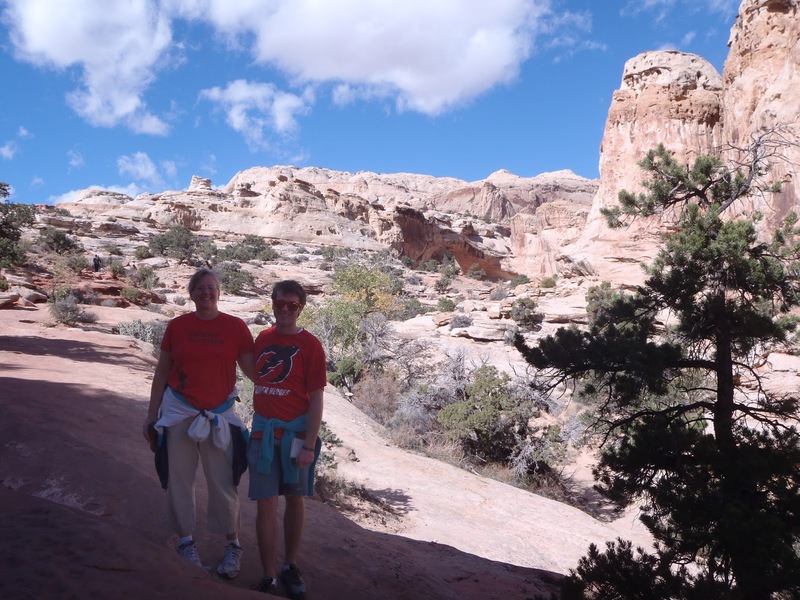 Momma Linda and me in Capitol Reef National Park with Hickman Bridge in the distance. Looking down the canyon. All cotton wood trees were yellow. The green field below is an orchard in Fruita. Last stop before lunch/dinner at Ruby's Inn. The next time you're needing a vacation, look at what's near your home. I had never visited Arches, or Canyonlands, or Dead Horse Point, or Goblin Valley, or Capitol Reef. And they're all within a four-and-a-half drive from my house! I'm kind of beating myself up for not seeing these things sooner. Now that I know how close these sights are, I'll be going again. Maybe for spring break. And this time I want to sleep in a tent. 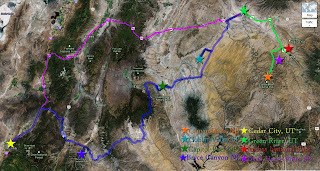 If you're a visual person, this is the route we took. I would like to do that again, too. It was fun. But I would still like to skip on the camping/tent part. Been there, done that. I prefer controlled temperatures and running water. I went on a trip almost identical to yours back in May (with my dad and brothers). We did the hotel thing too for a few nights but also got to camp. I loved it so much! Oh what a beautiful state we live in!